Is the ability to finish a wizard early a good idea? I am using a wizard dialog with 4-5 steps to let users input data of a business object. The data on the different steps of the wizard is not interdependent and the order of the steps feel natural when creating the object, at least in my opinion. Creating and editing objects takes place in the same wizard. So far so good. Now there are common cases where users need to edit a certain specific field of the business object. Because the field is on the initial page of the wizard, I thought about providing a "Next" and a "Finish" button, so one does not need to skip through all the pages to save the edit. Doing this should not lead to invalid or incomplete data, since validation would take place with every click on "Next" or "Finish" and the object would be complete after the initial creation wizard. Are there issues with this concept? In my opinion it would be better to distinguish between creating and editing the business object. For creation a wizard is fine. Besides the next button it could also have a finish button if the current and all following wizard pages only had optional information as input. 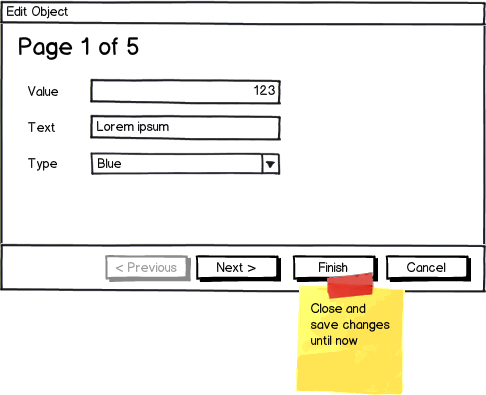 For editing an existing object a tabbed dialog could be a good choice, since allows the user to directly navigate to page or pages that should be modified. The concept is fine, but "Finish" is ambiguous as a label. It's better to more specific about what will happen if you press the button, for example "Save and exit". There is nothing wrong with the Finish button because it provides an exit shortcut for users who want to save and finish the process early. Otherwise, users who want to edit just the first page of the wizard, should click 4 times next until they can save and close the form. That's 4 unnecessary clicks. The thing you can do to improve the navigation of the wizard is to add a stepper progress bar. The users should have the ability to go to each step from that step bar. This will assure for even faster access to specific wizard steps. It should be possible in your case, as you pointed out that the data is not interdependent. It is definitely a good idea. I have used this approach - at a particular point in our wizard, the wizard has captured the important stuff it needed, so we allowed our users to finish the wizard early if they wanted too. I had to make sure the appearance of the Finish button was really obvious - some early usability testing showed some people didn't see it appear and didn't realise they could finish the wizard early. So not only did we make the Finish button briefly glow/flash a few times when it appeared (to make sure people were alerted to it), we also displayed a short message explaining they can finish now if they want to - this message faded out after 5-6 seconds and actually only displayed the first few times the user used this wizard. The primary benefit to a wizard, rather than displaying all the input fields at once, or in categorized tabs, or some other UI element, is that it organizes steps that must be taken in a specific order. An additional benefit is that the Next step may be different, depending on the input performed in the Current step. Allowing the user to Finish early indicates that the action is not really a series of ordered steps, but more like some mandatory and some optional actions. Let's assume we have such a wizard, and after step #3, the remaining steps are optional and the Finish option is enabled. As a user, unless I have seen this exact wizard before (and memorized it), I don't know if I'm actually finished though, because I don't know what the Next page looks like. I'm either going to click through the remaining pages of the wizard and do nothing, or hit Finish early and miss out on options I'm not even aware of. Some people may want to fill in what is on the third step but finished early without even knowing what it was. Instead of using a finish button to complete the wizard without seeing what other steps there are, use a skip button instead. You said that you prefer not to use this option, but you should still provide all the information to the user anyway. This way the user knows exactly what they could have done in all of the steps but may choose not to do them. Skipping is still one of if not the best option for these purposes. You cannot trust your data will be complete or valid the second time you enter the wizard, because even if it was valid and complete at first, data can be transformed or altered later by another process later. With that approach users are free to go back and forth or straight to the end, everything will be clear to them as a summary is presented at the end, and you can be sure your data will be valid according to your validations. I would say it differs. How important is the information users won't add if they exit right away? How easy is it to change? I think it's a very good idea as long as it's obvious what fields are left blank, and if users can easily find/change those options later. It's possible to allow for optional pages of supplemental information without deviating from the Wizard pattern if there is a page where the user selects "Use default settings" or "Use custom settings". Although many wizards that ask that don't bother to specify what the default settings are, the words "default settings" could be highlighted to indicate that clicking will show a list of those defaults. If the user selects "Use default settings", there will be no need to show the wizard pages related to the settings in question. If the user selects "Use custom settings" then having to use the same number of "Next" clicks when the user wants to edit something on the first page (and nothing else) as when editing something on the fifth (and nothing else) should not generally be objectionable. If there are several disjoint categories of settings and a user will often only want to edit one, the wizard could ask default/custom separately for each. It's okay to present a Finish button on or after the last page of required items, even if more optional items may follow. 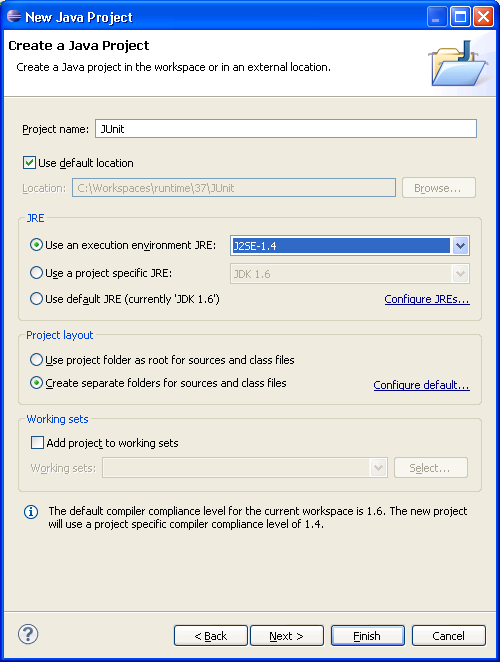 One solid example of this is Eclipse, where creating a "new project" presents a page that has required items, like the name of the project, the default runtime environment, etc. At the bottom of the wizard are buttons for Next and Finish. If you click Finish, you're given your new project. If you click Next, however, you can then add additional software libraries, etc. You should only present a Finish button if you can complete the wizard without visiting any remaining steps. The first few times a user may use the wizard, they'll be inclined to go to the next page to see what's on it, but as they become more familiar, they'll only continue on if they need the optional settings to be changed. You should not present a Finish button if the user could leave their data in an inconsistent state, or in a state that cannot be easily altered after completing the wizard. Not the answer you're looking for? Browse other questions tagged modal-windows wizard data-entry or ask your own question. How to implement a branching wizard? How do you deal with complex data entry, creating related records within a record within a record? Should Wizard be used for edit and modify? Why or why not? Wizard - Optional steps now or later? 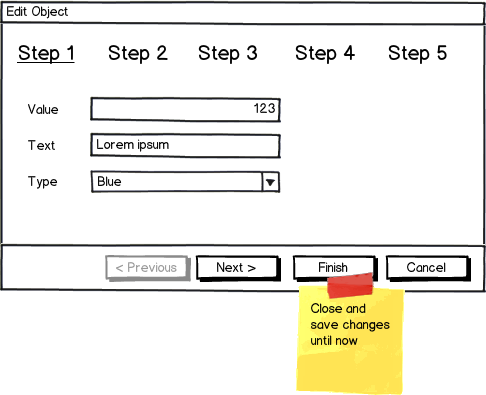 Navigation options in a wizard: next, previous, exit and save (finish later), exit without saving - too many?